Some cool things to review this week. These past couple of days I’ve received a few cool things to review. 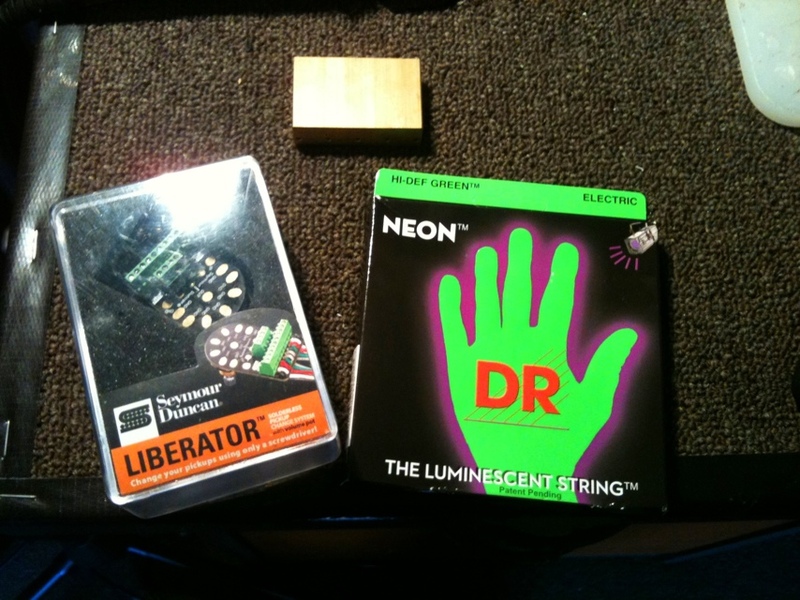 Thanks to Michael at Dominant Music, and Seymour Duncan I’ve received a Seymour Duncan Liberator solderless pot, and some DR Strings Neon Hi-Def Green strings. I have also received a Floyd Upgrades Brass Big Block for Ibanez Edge, thanks to Adam Reiver from Floyd Upgrades. I’m really looking forward to installing the Seymour Duncan Liberator as it will be really handy for doing pickup reviews, and DIY modification work. The DR Neon HiDef Green strings will look extra awesome on my Road Flare Red Ibanez RG550. Ibanez double locking tremolos come with pretty average pot metal sustain blocks, so the Floyd Upgrades block should prove to be an awesome addition. I’m planning to to work on installing the Floyd Upgrades brass block this weekend, so keep an eye of for my review. I’ll hopefully get a video recorded too. The Liberator will be installed very soon on one of my guitars in anticipation of some more DIY pickup modification work, so you’ll see that in action soon.